The parish of the Holy Prophet Elijah in Aliquippa, Pennsylvania gathered with great activity to observe the Twenty-Ninth Sunday after Pentecost on December 16, 2018. The day was permeated by the joyous anticipation that characterizes the season of the Nativity Fast, as the Orthodox faithful of this parish (like those elsewhere) prepare to welcome the birth of our Lord and Savior Jesus Christ. The day began with the most important and meaningful work of the faithful: the service of the Divine Liturgy. Celebrating the liturgy were the parish’s pastor, Father Branislav Golic; Father Rodney Torbic, the retired pastor of St. George parish in Carmichaels (Masontown), Pennsylvania and member of the St. Elijah parish; and Father Mark Kerr of New Gracanica Monastery in Third Lake, Illinois, who was visiting the St. Elijah parish. The newly renovated St. Elijah Church was filled with faithful, who were inspired in their prayers by the liturgical responses sung by the St. Elijah Serbian Church Choir. Following the reading of the Gospel, Father Mark offered a beautiful and edifying sermon that connected the day’s Gospel reading, regarding the Lord’s cleansing of the ten lepers, with the life and faith of St. Mardarije of Libertyville and All America, whose feast was celebrated on December 12. Father Mark noted that the grateful leper who was cleansed and St. Mardarije both shared the virtues of humility and thankfulness to God. As Father Mark explained, these virtues are centrally important to receiving God’s grace and gifts; and because of that, we must always approach God humbly, giving thanks for all and in all circumstances. Later in the service, over fifty faithful, including many children, approached to receive the Body and Blood of our Lord. The assembly of faithful continued in the church’s basement hall after the end of the Divine Service, where three distinct initiatives were in progress. The first initiative was oriented toward the care of our neighbors. For several years, the parish has participated in a drive to donate Christmas gifts to needy children who are serviced by the Beaver County Department of Children and Youth Services. This project, coordinated by Georgette Osman, has offered a way for St. Elijah parishioners to make the holidays brighter for hundreds of local children over the years. This year was no different: as December 16 was collection day for the project, parishioners on this day once again dropped off scores of festively wrapped gifts to help our young neighbors in need. The second of the day’s initiatives was oriented toward our children: the parish’s annual workshop in anticipation of the Feast of the Holy Wonderworker Nicholas, Archbishop of Myra in Lycia, on December 19. 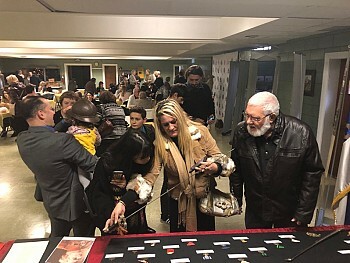 Several workstations were set up around the hall at which children prepared Christmas ornaments, decorated cookies, and planted psenicafor the upcoming holidays, all in the loving spirit exuded by the life and work of our dear Holy Father Nicholas. Organized by the parish’s Mother’s Club and friends of the church-school, this event has become one that is eagerly anticipated by children and parents alike. As the hall filled with the joyful noise of children playing and learning, refreshments and lunch were provided for all present. The third of the day’s initiatives was oriented toward our history. This Sunday marked the parish’s hosting of the traveling exhibit commemorating the centennial of the end of World War I, and the important sacrifices and role played by Serbia in achieving the Allied Powers’ victory. This impressive exhibit, which has been circulating among the parishes of the Diocese of Eastern America, was supplemented by additional items made available from the impressive private collections of St. Elijah parishioners. As supplemented, the exhibit included a display of authentic Serbian medals, a sword signed by King Alexander I, a complete WWI army uniform, and an authentic Serbian Army helmet. Many of those present spent time reviewing the exhibit and reflecting on the significant historical accomplishments it reflected. The bustle of fellowship among the gathered faithful continued on well into the afternoon. This can only be proof of the fact that the “busyness” of the world during the holiday season can still be transcended by Christ-centered activities rooted in faith and love of our neighbors. Glory to God for this blessed day, and for all things!